What is it about candle light that so draws us, like moths, to its flames? Watching children mesmerized by Shabbat candles, birthday candles and Havdalah candles opens the heart to the experience of awe and wonder as few things do. In this week’s Torah portion B’ha-a-lo-techa (see Numbers 8:1-4), God told Moses to instruct Aaron to make the seven-branched Menorah that stood in the Tent of meeting, accompanied the people during the years of wandering, rested in Jerusalem, and then for the past two thousand years is symbolically found in every Jewish home. 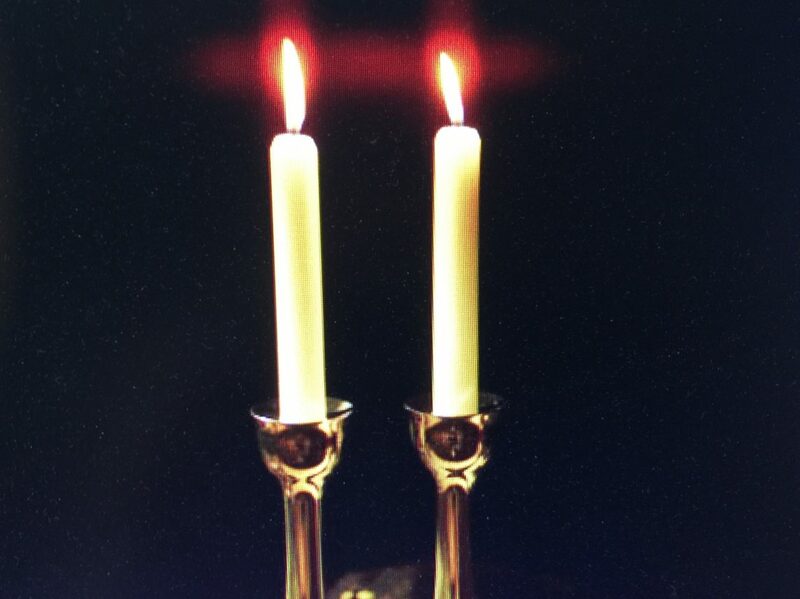 On Shabbat and the holidays Jews kindle two white candles – one for Zachor (“Remember the Sabbath Day” – Exodus 20:8) and the other for shamor (“Observe the Sabbath day” – Deuteronomy 5:12) – the themes expressed in the Shabbat Kiddush. In kindling light, a disarmingly simple act, we transform our homes, synagogues and lives with sparks of eternity and the vision of the world redeemed. We light the Shabbat candles first because “harmony in the home and in our communities – shalom bayit” precedes all else. Judaism teaches that nothing is more important than a home filled with mutual respect, affirmation and integrity. We kindle light each Shabbat to inspire the hope that there is a better world beyond division and polarization and that we can become activists for the good. Shabbat inspires us with a vision of shalom, harmony and the Oneness of God, and Judaism calls us to make real what we envision. There are two wars being waged against Israel by Hamas. The first is military and the second is one of public relations. Israel, as the far more powerful army, will always win the first, but Hamas is winning the second. Headlines around the world called Israel’s action to prevent a massive breach of the fence through which thousands of hostile Palestinians would pour into Israel intent on killing Israelis in southern Israel a “slaughter” and a “massacre” of innocent and unarmed Palestinian civilians. Many Palestinians were indeed unarmed, paid and forced by Hamas to charge the fence. However, Hamas was the primary perpetrator of the violence. 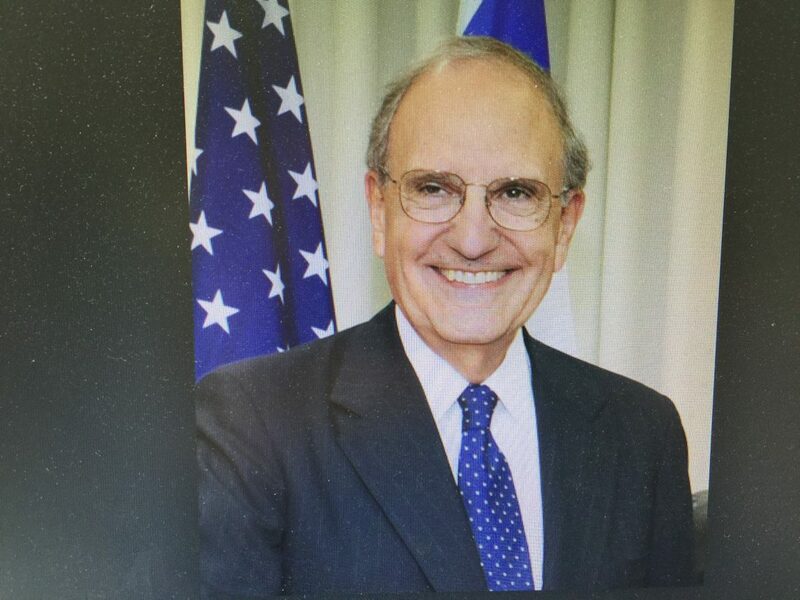 Had Israel “slaughtered” or “massacred” Palestinians, far more would have been killed on Monday, the day the American Embassy opened, than the 60 who died. Hamas itself said that nearly 50 of those were Hamas fighters. Psychological asymmetry is the relative advantage of the weaker party in a conflict to engage in otherwise immoral and illegal behavior against a militarily stronger opponent. Hamas and other groups have used their psychological asymmetry in engaging Israel for years, exploiting and placing civilians in danger to meet strategic goals. The current Gaza demonstrations are a prime example of psychological asymmetry being used as a strategic weapon by Hamas against Israel. The difference in perception among people who support and those who criticize Israel for civilian casualties in Gaza is not due to “facts” or “logic” of the situation. Rather, it is a result of an ideology of intersectionality that sees Gaza civilians as victims and as such immune from any responsibility for their fate. Consequently, in this ideological framework, the more powerful party, namely Israel, must assume the responsibility for keeping these civilians safe. Violating this responsibility, a difficult if not impossible situation, is what Hamas builds upon in presenting their case. The dilemma faced by Israel is exacerbated by media reports, which adopt this subjective view of intersectional ideology and present morally symmetric descriptions in a situation where asymmetry abounds. Dr. Mandsorph’s perceptions of the intersectional argument is worth reading. I recommend that you read the entire piece. Note: I trust Don Futterman. He’s moral, a humanitarian, a smart critical thinker, a loyal left of center Israeli. In this piece, he asks all the right questions and doesn’t give knee-jerk opinions or succumb to Israeli self-justifications and hasbara. He understands the depth of despair in Gaza felt by hundreds of thousands of Palestinians as well as Israeli fears that the Gaza-Israeli border will be breached and thousands of Palestinians could pour into Israel with violent intentions against Israelis living in small communities in southern Israel. He knows that Hamas is a brutal demagogic and dictatorial ruler that is taking full advantage of the moment for its own anti-Israel purposes, and he’s well aware that Israel (and Egypt) blockaded Gaza thus exacerbating the poverty and despair of Gazans. Don suspects that the demonstrations of the past few weeks are more than simply innocent Palestinians acting out, though there are many unarmed Palestinians among them. In other words, we are witnessing both a humanitarian crisis and a complicated, confusing and bloody mess. Read what Don says. (I urge readers to subscribe to Haaretz. I am printing Don’s entire piece because I know many of you would not see this otherwise). “Out of exhaustion, complicity or alienation, we increasingly defer to the endless spin of our arrogant leaders. We’ve stopped asking ethical questions about our responsibility for the death and despair in Gaza. Note: Rabbi Eric Yoffie is always worth reading, and his column on the Gaza War does not disappoint. As I explained in a letter to Eric (a friend), this is as sensitive and difficult a challenge as we liberal Jews and lovers of Israel have faced in some time. Just because liberal commentators who I respect (as does Eric) are critical of Israel’s response to the thousands of Gazans attempting to breach the fence along the border doesn’t make them right or balanced, and I am sad to say, they are in this case neither. “The death toll in Gaza has left me reeling. Many of the dead were innocents; some were children. Each and every death was tragic, rending the heart. And the questions had to be asked: Who was to blame? Was Israel the guilty party? Had the Israeli army acted carelessly, shooting hastily into crowds of helpless civilian protestors? Or, even worse, were the killings an intentional act of cruelty, intended to teach a lesson to the hated Hamas enemy? For some, the answers were easy. Is a professor at Princeton really saying that the leaders of Hamas, known for their wholesale murders, casual cruelties, obsessive anti-Semitism, and devious terror are somehow comparable to the leadership of the American civil rights movement? And that Israel’s need not to be overrun by huge, angry mobs of terrorists and demonstrators is equivalent to Bull Connor’s desire to perpetuate permanent segregation of black and white in America? And that the prayers of civil rights leaders that their children not be harmed are equivalent to the desire of Hamas leaders that their children be wounded or killed? Charges of disproportionality are among the most common leveled against Israel in her long struggle against Hamas, and they are among the most infuriating. Are Goldberg and Cassidy suggesting that if there were a lot more Israeli dead, and a hundred Jewish bodies were strewn across the desert in southern Israel, then Israel’s action would be acceptable, or at least more readily forgiven? If not directly stated, that is what is implied. But Israel will not sacrifice a single life in these long-suffering towns without a fight. Neither will Israelis permit an Israeli soldier or civilian to be kidnapped without doing their utmost to stop it. That is why Israel will do what she must to repel these mobs, and it is a moral obscenity for Goldberg and Cassidy to propose that she should do otherwise. And if either of them was a resident of a town near Gaza, they would be quick to demand – just as the current residents do – that Israel’s military do no less. I should note that as an American Jewish liberal, I am a fan of both Goldberg and Cassidy, not to mention a regular viewer of MSNBC. And so I found myself asking whether my sympathies for Israel had skewed my thinking. After all, we can all be victims of our ideological straightjackets, and Professor Glaude was right about one thing: Babies had died. And minimizing these deaths is unacceptable to me, as both an American and a Jew. I therefore looked long and hard at the question of whether or not Israel’s military had alternative means available to contain the demonstrators. Multiple commentators have argued that non-lethal methods of restraint would have been sufficient and greatly reduced the death toll. But this argument seems to me more a wish than a reality. The rules of engagement were not a secret. Israel is a small country, her army is a people’s army, and its preparations for the May 13 demonstrations were widely reported in the media. What one learns from reviewing this material is that 40,000 to 50,000 determined protestors – the number at the height of the protest – cannot be contained with water hoses or conventional crowd control. All reports indicate that Israel’s training of its soldiers was intense, instructions were detailed, and experienced officers were in command. Shoot-to-kill was not a first resort but an absolute last resort. Nonetheless, if resorting to deadly force had been ruled out, a breach of the fence by thousands of demonstrators was likely inevitable. And the result would have been chaos, terror, and locking down all of southern Israel. No Israeli government, of the right or the left, could tolerate such an outcome. Does this mean that Israel is blameless? Not at all. The misery in Gaza has reached intolerable levels, and while Israel is not the sole, or even the primary villain here, it must share responsibility with others for the suffering of her neighbors. In 2007, the Quartet – Russia, the United Nations, the European Union, and the United States – set out the conditions for normalizing the political status of Hamas and for moving ahead with a plan to provide international support for Gaza residents. These conditions included a Hamas commitment to non-violence, recognition of Israel, and support of past international treaties and obligations relating to the Middle East. Hamas refused then, and refuses now, to meet these conditions. It is this refusal, and not the actions of Israel, that isolates Hamas and makes it a terrorist group and an international outlaw. To all of the above must be added its ongoing feud with Egypt and the Palestinian Authority and its redirecting of humanitarian aid for military purposes. And the result is the humanitarian crisis that has made life in the Strip unbearable for all but a tiny elite. Israel cannot resolve these problems alone, and the politics of resolving them are complicated. Israel would prefer to help the residents of Gaza without strengthening the hands of Hamas. But it is neither practical nor moral to ignore the plight of nearly 2 million people on its southern border – which is mostly what she has done up to now. So now is a good time for Israel’s Prime Minister Benjamin Netanyahu, who is basking in the glow of his recent diplomatic triumphs, to put forward an Israeli plan to relieve the suffering that Hamas has inflicted on the residents of Gaza. Now might be a good time for Israel to reach out to America, Saudi Arabia, and the Sunni world for help in implementing such a plan. And now might be a good time for Bibi Netanyahu to take advantage of ideas proposed by his own cabinet members – such as building an artificial island off the coast of Gaza – to improve Gaza’s economy. I’m glad that Rabbi Hartman wrote this piece. I too have been paralyzed into silence by the demonstrations and violence on the Gaza-Israeli border and remaining silent is not a position in which I take comfort. Donniel Hartman articulates my own position well. A few thoughts before you read Rabbi Hartman’s reflection in The Times of Israel below. The people of Gaza are suffering, and the reasons for their suffering are complex. On the one hand, Hamas is a brutal dictatorship that cares more about destroying Israel than caring for its own people. On the other hand, Gazans have 4 hours of electricity a day, unsanitary drinking water, 40% unemployment, and far too much despair that their situation will change any time soon. The Gaza strip is blockaded by both Egypt and Israel. Though most Gazans are non-violent, Hamas has turned the demonstrations into a war. Israel has responded as any nation would. We can debate whether it is necessary to use live ammunition, but we are not there and we have to trust the judgment of the IDF commanders who are. That being said, I defer to Rabbi Hartman. –Former Shin Bet chief Yoram Cohen said during a security conference in Herzliya. Har Hazeitim contains the most holy Jewish cemetery in the world, the closest burial ground to the “The Golden Gate” of Jerusalem that was sealed by the 16th century Ottoman Qalif, Suleiman the Magnificent, because he feared that the Jewish Messiah would pass into the holy city through this gate in the end of days. Jews have been burying our dead on the Mountain of Olives for centuries so their souls would be close and ready to follow the Mashiach (“Messiah”). Jerusalem has been conquered thirty-four times since the age of David. It is arguably the most famous and fought over real estate in the world. It is a city of the in-between. It embraces old and new, past and present, east and west, reason and faith, earth and heaven, this world and the world to come, imperfection and messianic dreams, temporal and divine power. It has been and remains the symbol of a history of intensely competing interests. Israel celebrates “Jerusalem Day” this Sunday, May 12 (28 Iyar), marking 50 years since Israel reunified the city after the 1967 Six-Day War. Though Jerusalem has rarely known peace, it is an enduring symbol of our people’s yearning for peace nevertheless. What is to become of this sacred city for so many going forward? Most Israelis don’t want it ever divided again. For the past 50 years Israel has maintained the peace and security of Jerusalem and free access for peoples of all faiths to the city’s holy sites. Yet, distrust and hatred fills still too many hearts and pollutes too many minds. Spitting and shoving, vandalizing and threats, provocation and incitement, violence and murder continue despite efforts by Israeli security to prevent it. In the coming weeks, the United States will formally move its Embassy from Tel Aviv to Jerusalem in a controversial decision taken by President Trump that shook the Arab world. Yet, Jerusalem is the people and State of Israel’s capital city. Its government buildings, the Prime Minister’s and President’s residences are there. I believe, despite the deep distrust and hostility that there is a solution, but that will take the willingness to compromise and accommodate the needs of the “other” not as some kumbaya liberal dream, but for the sake of peace, security, the survival of and the dignity of all peoples.